It's all too easy to lump in Pitt Cue with the myriad of other no-reservations, Southern USA BBQ restaurants that sprung up in the capital half a decade ago. It's true they were masters of the low'n'slow style, famous for their giant, treacly beef short ribs and delicate smoked chicken wings, and yes, it's also true that their tiny Soho premises and bourbon-based cocktail list was the template for a city-wide BBQ boom. They were, unquestionably, hugely influential - and hugely popular. "Pitt Queue" was the nickname given as the crowds snaked down Newburgh Street. But the fact is, Pitt Cue was always a lot more than a BBQ joint. Tom Adams may be at the top of his game when it comes to putting flame to delicacies such as Dexter beef or Mangalitza pork, but his time working with Jeremy Lee has given his food a lightness and intelligence that always set him apart from the Smoke Shops and Grill Stacks and countless other rib-peddlers in London. All this is plainly evident at the brand-spanking new Pitt Cue premises in Devonshire Square, where the run of a vast kitchen and some seriously impressive charcoal ranges looking like something from a medieval torture dungeon has allowed Adams to create a menu so comprehensively attractive that choosing from it isn't so much a case of picking which dishes you think you'll like the most than deciding which few would be the least traumatic to leave out. The only way of leaving Pitt Cue without a serious attack of the FOMOs is to book a nice big table and order the whole damn lot. Maybe twice. 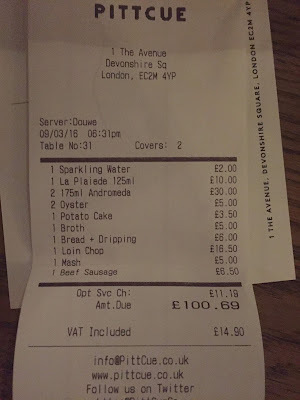 Sadly, there were just the two of us on my most recent visit and so what follows is the best two very greedy people could manage in one sitting. "Potato cakes" from the Snacks menu were batons of pressed slices of potato, presented with a dipping sauce which I think may have contained some kind of fish roe. 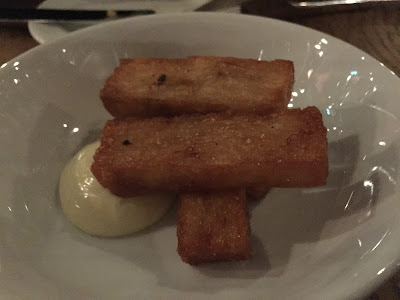 Reminiscent of the confit potato at Quality Chop, with an irresistable combination of golden crunch and soft filling, they were impossible not to love. 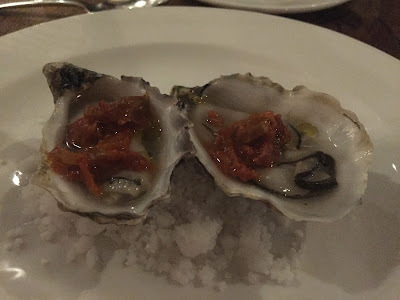 Oysters (rocks from Cornwall) came with a little dollop of house kimchi, not enough to overpower the shellfish but with enough of a pickle/chilli kick to turn it all into a fresh and exciting new thing entirely. It was a kind of turbocharged version of putting Tabasco on oysters, and I love Tabasco on oysters. "Eel broth & bacon" was a beautiful (you'll have to take my word for it) bowl of seafood consommé dotted with pickled celery and gorgeous toasted walnuts. 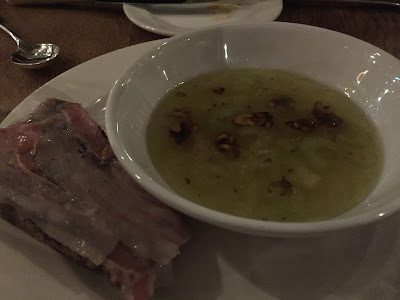 It was the best soup I have had the pleasure of eating in years, but as if that wasn't enough, it came with a slice of toasted sourdough draped with slivers of silky ham which added another meaty, fatty element. 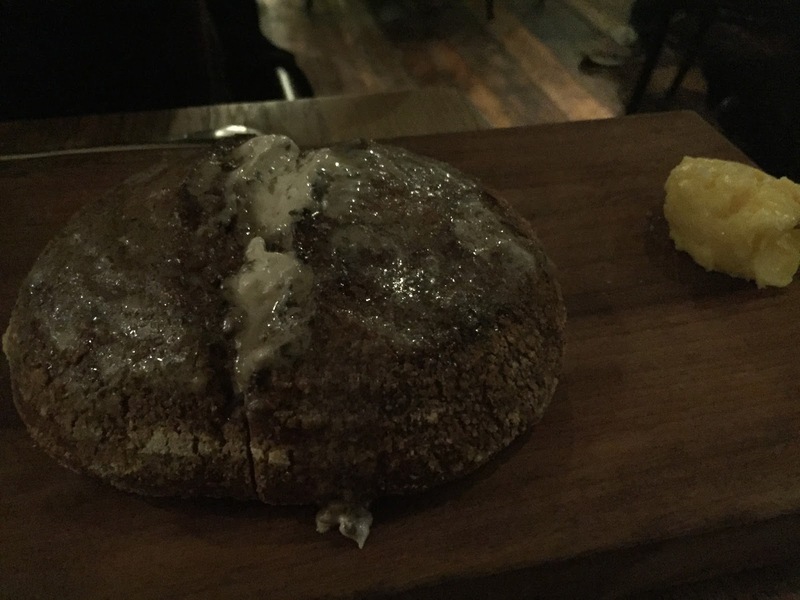 "Dripping bread" was a loaf of dense, syrupy malt bread soaked in beef fat, and of course was brilliant. I'm not entirely sure it needed the extra serving of butter, but somehow we still ended up using it so maybe it did. Pitt Cue have obviously spent a lot of time on their bread offering, really making the most of the extra oven space since the move. There were a few different kinds on offer and all were world class. "Dexter & Ogleshield sausage" was another supremely succesful marriage of excellent ingredients. The beef, firstly, was incredible stuff, with the flavour of fine aged steak but with a lovely loose texture, and the funky cheese brought out the best in the beef in the same way as Ogleshield does in the Hawksmoor burger. In fact, this dish could best be described as a steakhouse burger without the bun, topped with some delicate pickled veg. 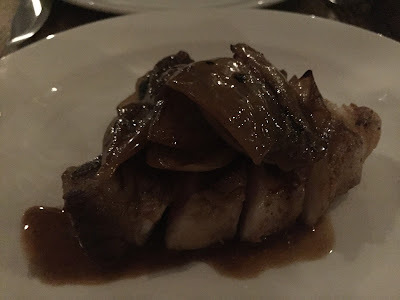 The only main course we could find room for was a Mangalitza pork loin, a dictionary-thick slab of meat, firm of flesh and juicy with generous ribbons of soft fat, dressed with caramelised onions. Like everything that had come before it, it was a combination of impeccable sourcing and intelligent cooking that informs everything Pitt Cue do. 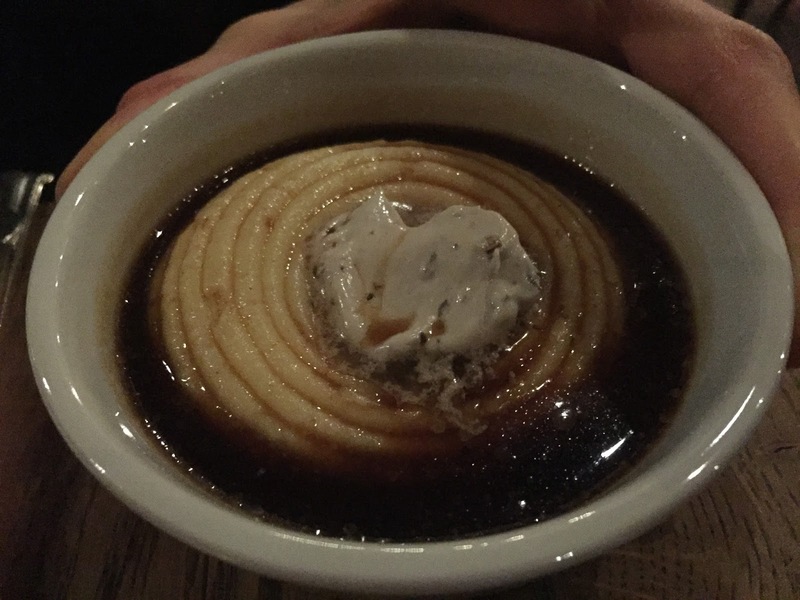 Ah, but we could hardly leave without ordering a portion of the legendary Pitt Cue bone marrow and mushroom mash, which was every bit as wonderful as I remember from Soho with its fluffy buttered potato and swirls of meaty jus. It may be unfair to single out this side as a signature dish when everything else had been so good, but there does seem to be something particularly special about this mash, judging by the numbers of people swooning over it on social media. I've been focussing on the food, because that's what I do, but everything else about the place is clever and considered. The decor, while not making for great blog photos (to say the least) is classy and understated, the service is faultless, cocktails from co-founder Jamie Berger are still great (and still include Picklebacks) and the wine list managed by Crispin Sugden formerly of Goodman and Beast has loads of interesting (if occasionally punchy) options by the glass. We spent £100 between the two of us but without a couple of £15 glasses of wine the bill would have been more like £25 a head. You can even reserve a table so you don't even need to worry about getting there early to queue up. 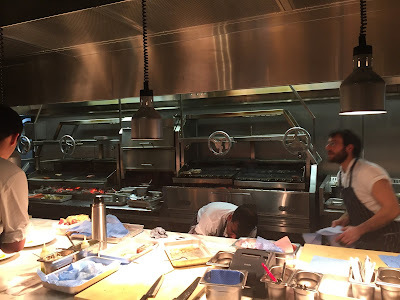 In short, there's really nothing to criticise at all - already firmly settled and confident in its new skin, it may just be the ideal London restaurant. What are you still doing here? Quick, book now. Pitt Cue, in its new East London premises, is already in the 2016 version of the app. But if it's booked out one evening (which is more than likely), use it to see what else is in the area. Fantastic Post, I have, as we speak A tea brine on the go from Pitt Cue book. I'm putting some duck legs in it. I have no Kettle barbecue for smoking whole ducks, that matters not. So many things , cocktails to ketchups and beyond, that are, absolutely wonderful! A superb book, we should all buy this book. Earlier in the week I made and used their duck rub, seriously good as are the other rubs. I made Banoffe Mess, man that ticks some boxes, admittedly its erm a bit fattening . The Pitt Cue book is worth buying, just for the bourbon caramel recipe alone. 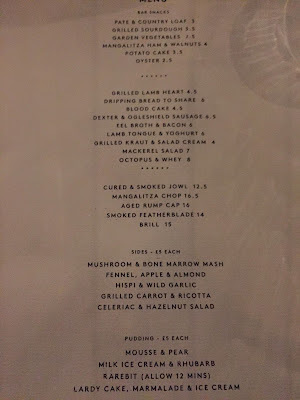 My brief visit to Newburgh Street with not much money, had me eating lambs tongue, which my mother new about, but my sheep farmer friend did not. Believe me, it was amazing as were pickles on the side. 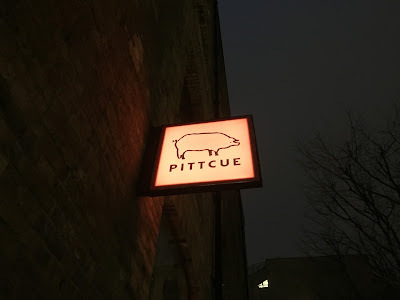 Next trip to London, I am absolutely going to visit Pitt Cue! This post shows how good they are, Maximum respect Chris! 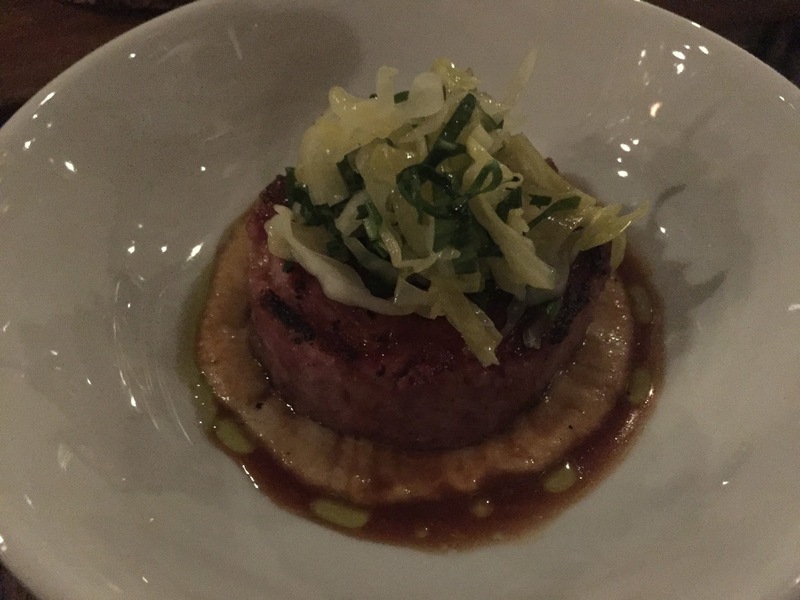 Seriously readers visit Pitt Cue, worthy of 10/10 for sure. Will be making Bone marrow mash next week, Waitrose sell bone marrow, as do some good butchers. Thanks for the inspiration. I went a couple of years ago and left disappointed. It's not that it's horrible just horribly average. I'm guessing i am very much in the minority with this view. Ate here the other week, and although it was good, it wasn't earth-shattering. My main thought was that although the meat dishes were great (the blood cake was delicious, particularly), there was very little to temper the towering richness of it all - even the celeriac salad we had was effectively a big creamy coleslaw. I'd have murdered a big plate of collard greens, or anything green, fresh or sharp, actually... maybe a side of the pickled veg from the sausage dish? 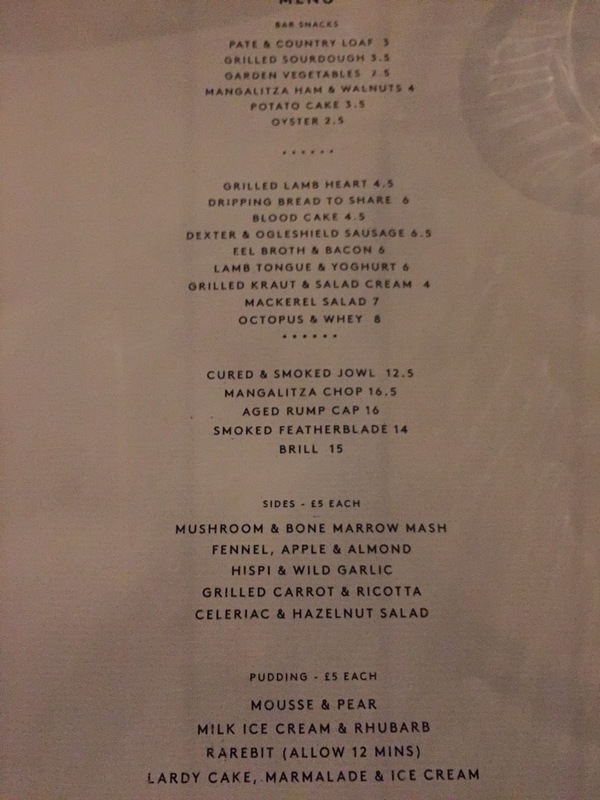 Also, all the City boys had been in after work and hosed all the specials, so even by 8ish, there was pretty much nothing left on the board apart from the massive, expensive beef rib-eyes (and if I want to order steak like that, I'll go to Hawksmoor). I know it's difficult to judge, but that's way to early in the evening to be running out of dishes. The dessert - Lardy Cake - was poor, with a horrible burnt bitterness to it and a sense that it had been sitting somewhere for too long. I loved the old restaurant and I wanted to love this, but it just missed the spot in too many ways. Shame really.